Executive Chef Marc Johnson at Oak Grill at The Island Hotel in Newport Beach just launched Slow Smoked Sundaze. It’s a relaxed, family-style, smoked BBQ Sunday. Chef Marc is here with all the succulent details. Chef Marc isn’t just playing around with grilling and barbecue here. He has three years of serious regional cooking experience in Huntsville, Alabama. That’s real barbecue country! His creations at Slow Smoke Sundaze play homage to the various styles of American regional barbecue. Slow Smoked Sundaze is an inspired idea for Dad on Father’s Day on June 19th. It’s a reasonable $34 for adults with generous portions. You’ll probably have food to take home. It’s always a good time for classic regional barbecue. Last Saturday the Queen Mary hosted their 4th annual West Coast BBQ Classic (WCBC) which featured over 60 different SoCal-based champion grill masters and BBQ teams competing for the coveted title of West Coast’s Best BBQ along with cash prizes. This BBQ competition is California-State-Certified and Kansas City Barbeque Society (KCBS)-sanctioned. The competition highlighted various grill styles from across the nation including slow-cooked hickory Texan and southern Memphis-style barbecue. The Grand Champion of chicken, pork ribs, pork and brisket, Sterling Ball, of Big Poppa Smokers in Newport Beach and La Quinta joins us. He was Number One overall with a 1st Place Finish (a perfect score) in Chicken and a 3rd Place Finish in Brisket. Big Poppa Smokers also has an on-line barbecue supply store. They are particularly known for their award-winning rubs. Gretchen Beaumarchais is the creative executive chef here at Angel Stadium. This is her 3rd season at The Big A. She will be sharing with us what’s new in food and beverage at Angel Stadium including the new Ketel One Club. There is an incredible pastry chef in-house (Ashley) who previously was creating the decadent desserts at local luxury hotel. Rest assured there is lots more craft beer on the menu! The Smoke Ring Brisket Sandwich has proved so popular that a Smoke Ring Express stand has been added to the Concourse. The brisket is smoked for 14 hours. Can you say deliciously tender ? Peet’s Coffee (an aficionado’s choice) is now on the Main Concourse with a cart. Adjacent to it is a decadent Dessert Cart with all house-prepared goodies created by a real pastry chef. What makes for a great burger? The classic, full-service neighborhood butcher shop is alive, well, and prospering at the 3-year old Lindy & Grundy Meats in the Fairfax District of Los Angeles. Artisan butcher Erika Nakamura (half of the Lindy & Grundy team along with Amelia Posada) was with us to fill us in. Erika is also a classically trained chef. All of their premium meats are from humanely treated, grass fed animals and 100 per cent locally produced and sustainable. The partners only source meat from farms they have visited. They even inspect the harvesting facility where the animal is processed. They offer an alternative to commercial farming. Here’s a tip for home tailgaters. On Sunday afternoon from 3 to 4:00 p.m. they feature “Smokey Sundays.” Each Sunday they offer a variety of slow smoked meats from their grill. You might see brisket, smoked ribs, chicken, buffalo chicken wings and more. Call that Sunday to see what’s on that menu. They also offer educational classes. On Sunday afternoon, February 10th The Viceroy is hosting the 1st Annual Noodle Bowl Festival in commemoration of Chinese New Year. East and West chefs are joining together for the afternoon. Unfortunately the 500 available tickets were gone by the end of January. 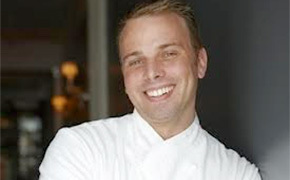 Chef David LeFevre of M.B. Post in Manhattan Beach is preparing brisket and oxtail pho. The Seoul Sausage Co. boys (winners of Season 3 of Food Network’s “Great Food Truck Race”) are cooking Korean budae jigae with braised pork belly and their signature sausage.